Visit the Bingling Temple Grottoes, which can only be accessed by boat. Wander in Labrang Monastery and chat with Tibetan monks. Meet the &apos;Color Palette Overturned by God&apos; — the Rainbow Mountains. Grasp the opportunity to see the Mogao Caves, which might disappear in 50 years. Explore the ruins of the ancient city of Jiaohe, a city that was built by digging down instead of building up from the ground. There are many ethnic minorities living along the Silk Road and they have different customs, cultures, and languages. They live together harmoniously and their cultures interweave and integrate, forming a colorful and diversified Silk Road community. In this tour, you will experience the Han, Tibetan, and Uyghur cultures. Your private guide will be waiting for you in the airport/train station arrivals area. A comfortable vehicle (non-smoking) with an experienced driver will transfer you directly to your hotel. Your guide will help you to check in. Lanzhou has many flights connecting to main cities in China so, if you need one, we can arrange a domestic flight to Lanzhou. As one of the important cities along the ancient Silk Road, Lanzhou has preserved many cultural heritages. You will visit the Bingling Temple Grottoes, which can only be accessed by boat. You will be driven to the Liujiaxia Dam and then you will take a fast boat to cross the gorge where you will enter the Bingling Temple Grottoes, which you will discover are above the water. These caves, which stretch for 200 meters, were built during the 3rd and 18th centuries. They are highly valued for their contribution to research into the history of Chinese paintings and the spread of Buddhism during that time. Many ethnic minorities live along the Silk Road. In Lanzhou, most of the residents are Han and Bai people, and their customs are mostly like those found in mainland China. You will go to Xiahe and meet some Tibetans who believe in Tibetan Buddhism. The visually stunning Yellow Hat Sect of Tibetan Buddhism has its most important monastery in Xiahe, Labrang Monastery. If you are lucky enough, you will have the opportunity to walk with a monk and ask him to show you around the halls to explain the stunning works of art housed there. The view of yaks roaming in the Sangke Grasslands amid green pastures is something to behold. In this area, nomadic people can still be found singing their traditional songs and this is often one of the highlights of any visit to Tibet. After breakfast, take a morning bullet train to Zhangye where you will visit the ‘Color Palette Overturned by God&apos; — the Zhangye Danxia National Geological Park, which is home to the Rainbow Mountains. After returning to the city, enjoy a local lunch and continue on to see the largest reclining Buddha in China at the Giant Buddha Temple. Enjoy some free time in the evening before boarding the train. You will have a private compartment with a deluxe soft sleeper on the overnight train. Have a good sleep before you wake up the next day in Dunhuang. Ganzhou Market is the busiest place in the evening in Zhangye. There, you can try various local foods. People love to gather there to enjoy barbecues, sweetmeats, noodles, and beer. 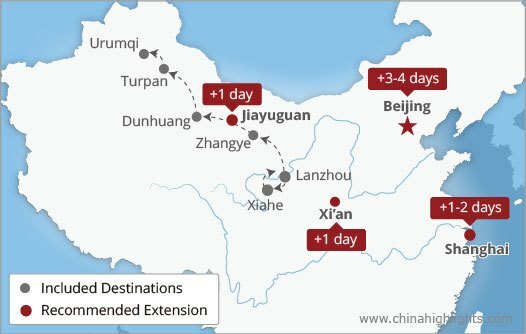 Now you&apos;ve arrived in Dunhuang, you are at a point of vital strategic and logistical importance, being on a crossroad of two major trade routes within the Silk Road network. Your guide will be waiting for you at the train station and will have arranged for you to have breakfast at your hotel. After breakfast, visit the enchanting Mogao Caves to marvel at the exquisite murals and lifelike sculptures. In the late afternoon, as the heat starts to fade away, you will visit the Singing Sand Mountains and Crescent Moon Spring. Ride a camel in the desert and imagine how caravans crossed the desert over 1,000 years ago. If the Mogao Caves are not enough to satisfy you, we will take you to the Dunhuang Research Academy where you can linger over the copies of murals created by masters. You can also copy a sample mural on a mud slab with your own hands under the guidance of the teacher. In the morning, you will visit the ruins of the Great Wall of the Han Dynasty (206 BC – 220 AD). It is the oldest example of this defensive system in China. Check the ruins and you will find it is different from the Great Wall that you have seen in pictures. 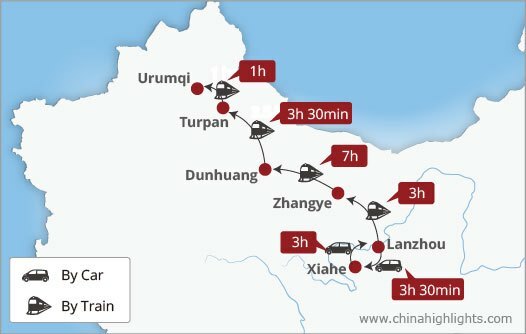 After lunch, board the bullet train to Turpan. Once you have entered Turpan, you will find it is quite different from other places in China. Most of the inhabitants are Uyghurs and they believe in Islam. You will see some of the ancient sights in Turpan: the Emin Minaret, which is the only ancient Islamic minaret left in China, and the Karez Well System, which is one of the three ‘great ancient projects&apos; in China. Grape Valley is very touristy so, instead, we have arranged for you to visit a local family who run a vineyard, giving you a taste of the local lifestyle, literally. Then you will be driven to the ancient city of Jiaohe, an island-shaped plateau situated in Yar Town. 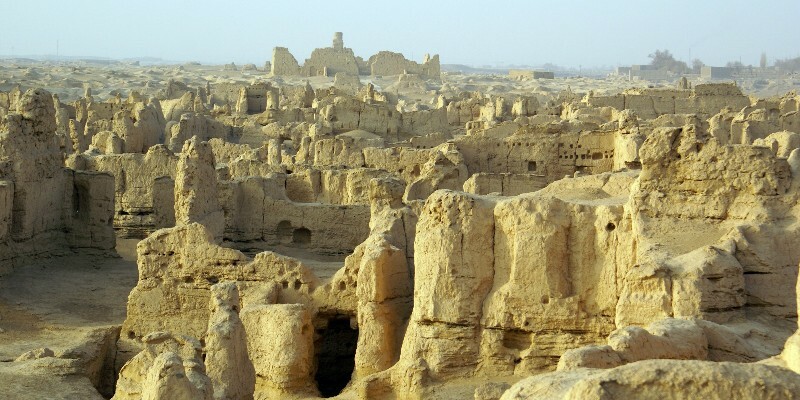 It is the largest, oldest, and best-preserved earth-structured city in the world, with a history of almost 2,300 years. 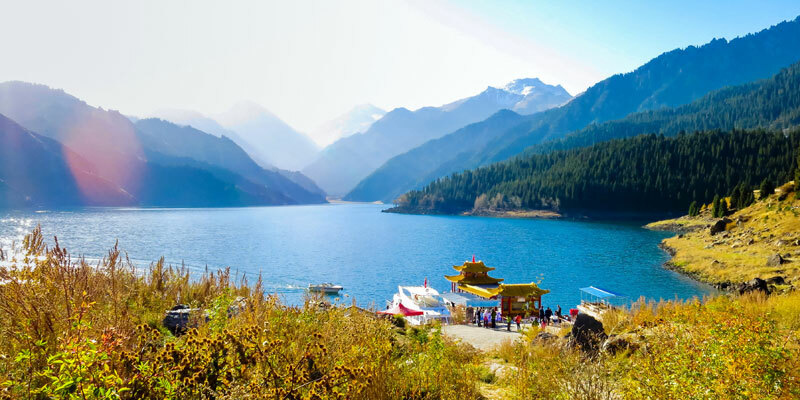 Your guide and driver will transfer you from Turpan to Urumqi, where Heavenly Lake awaits you. The view is one of a kind — see the snowy peaks of the Tianshan Mountains reflecting on the dazzlingly blue lake surface. A cruise on Heavenly Lake is one way to appreciate its beauty but there is also a cable car going up the mountainside for an even better vantage point and some great walking paths. It&apos;s time to say farewell to your memorable Silk Road trip. After a pleasant breakfast, we will transfer you to the airport for the flight back to your hometown or next destination. Bon voyage! This tour includes an overnight train experience. We have arranged a deluxe soft sleeper for you, which means you will have a private compartment with a door and two soft sleepers (bunks) in it. The bunks are each equipped with a pillow and a blanket. All the bedding is clean and sterilized. If you are traveling in a group with more than two people, we can also arrange normal soft sleepers for you. This is a compartment with four soft sleepers (bunks) to make sure that your group is in one compartment.